A long time ago, Sonia and I checked out the chocolate chip equivalent of these and were fairly impressed. The cookie base is pretty much the same animal here. It's crispy and crunchy, as the name would imply. I do prefer soft cookies, but as crispy cookies go, these are top-shelf. I'm sure it's much more difficult to make a gluten-free soft cookie, anyway. Flavor-wise, there's a nice sweet butteriness to the cookie. If you're taking modest bites, not every bite has a chunk of ginger, but the ones that do have a lot of ginger. Sonia wishes it were more evenly distributed. I totally agree. I'd prefer ginger bits to ginger chunks—which, incidentally, have nothing to do with fat redheads. Also, never ever Google "fat redheads." The zesty, spicy zing of the ginger isn't quite as potent as that of some other products we've seen in the past, such as the Ginger, Almond & Cashew Cereal, but it's still strong enough to get your attention. In this instance, though, we both think the ginger flavor blends pretty well with the rice flour base. As the front of the packaging suggests, there is a supple "melt in your mouth" quality about these baked goodies that's very pleasant for the gluten-sensitive and non-gluten-sensitive alike. As far as scores go, it looks like another four stars from Sonia and another three and a half stars from me. I like the cute cartoony chefs on the package. Yeah, they're cool aren't they? TJ's always use great art to draw cartoons! I'm certainly not gluten free, but i am a serious ginger lover. 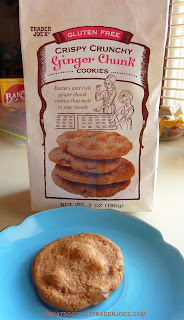 Usually i get the triple ginger snaps- aka the Only purchased ginger cookie with enough ginger flavor for me :). Are these similarly intense? Or just when you get the bite with ginger and the rest is like a sugar cookie? Yes I'd say these are similarly intense. I guess what I said in the post is a little misleading. More bites than not DO have a lot of ginger, but it is possible to have a bite in each cookie without ginger...and yes, they're similar to sugar cookies when you get those ginger-free bites. These sound like a knockoff of Tates Ginger Zinger gluten-free cookies, which I love by the way.